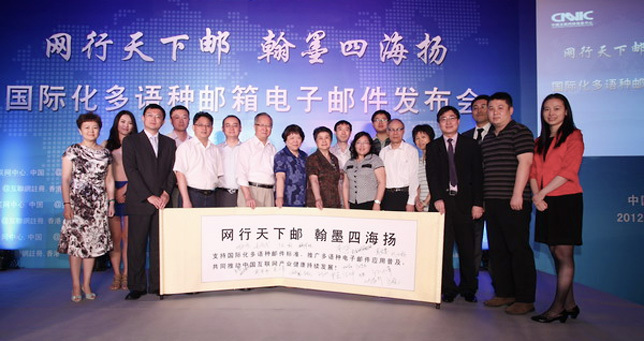 On June 19, 2012, the Chinese Academy of Sciences (CAS) conducted the first public multilingual Internationalized Domain Name (IDN) email trials — and Afilias was one of the sponsoring participants. IDN email allows people to use almost any language in their email addresses for their user name, second-level IDN domain name and top-level IDN. This event represents a significant milestone in opening the Internet to users of all languages, not just ASCII languages as before. Making multilingual IDN email work successfully is technically challenging. But thanks to the efforts of the CNNIC, in conjunction with the Internet Engineering Task Force, the IDN email standard (RFC6531) works as designed, which the world saw at this event. Soon, people in all countries will be able to use their own language as part of their email addresses to send and receive mail, making the Internet more user friendly and diverse. Kun Qian of Afilias' team in China said, "This event helped demonstrate the multi-language, cross-cultural capabilities that are coming to the Internet. This is an exciting time for the Internet — and it's exciting for Afilias to be part of it."